The Blinn College District’s Welding Program offers competency-based training in welding technology for students pursuing college credit or participating in continuing education. The technical skills program is designed to provide the knowledge and hands-on skills required to join the workforce. Coursework is provided in techniques including STICK, MIG, TIG, and pipe. 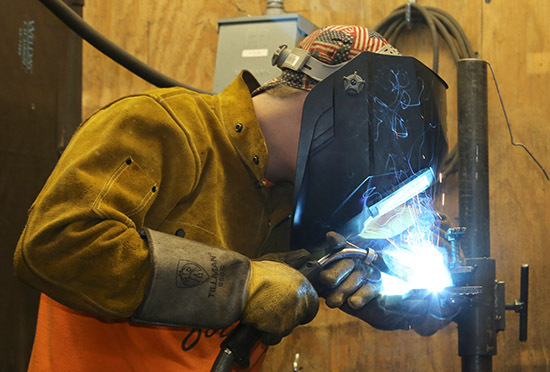 College credit programs build upon each other and include a Certificate I, Certificate II, and an Associate of Applied Science (AAS) degree in welding technologies. With the credit program, technique coursework is interwoven with blueprint reading, quality control and inspection, and hands-on experience provided through internships. Blinn offers credit welding courses at the Highway 60 Training Center in College Station. Non-credit technical skills training is available in College Station, the A.W. Hodde, Jr., Technical Education Center in Brenham, and the Schulenburg Campus. Students who successfully complete the 60-hour Welding Technology AAS degree can earn the National Center for Construction Education and Research (NCCER) certification, a nationally recognized certification that qualifies student for jobs across the nation. Program graduates are qualified for jobs as welders, welding fabricators, welding supervisors, pipe welders, welder fitters, maintenance welders, welding inspectors, welding instructors, welding engineers, and metallurgists. According to Workforce Solutions Brazos Valley, employment of welders is projected to grow 17 percent between 2014 and 2024. Welders can expect to earn an hourly wage between $11.69 and $20.06 depending on their experience.